Dental implants are very strong, stable, and durable and will last many years. With the ability to acquire 3D images, our office can now offer computer guided implant placement in most cases without incisions and stitches. Local anesthesia is all that is required. We can offer patients a wide range of options for their tooth (teeth) replacement. Our approach is a restorative driven protocol where we place implants (number & location) based on what replacement option the patient chooses. 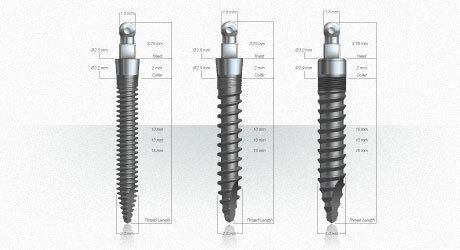 Inclusive Mini Implants are self-tapping threaded titanium screws indicated for provisional and long-term applications. These devices allow for the immediate loading and long-term stabilization of dentures in the presence of primary stability and appropriate occlusal loading. "Mini" or small-diameter implants (SDIs) are traditionally prescribed for patients who do not receive root-form implants due to medical, anatomical or financial reasons. The benefits include a minimally invasive surgical protocol, immediate loading and affordability. They can accommodate new or existing dentures, which are anchored to the heads of the mini implants via a simple and effective O-ring retention system, providing edentulous patients new levels of comfort and confidence. A mini implant typically has a diameter of 3.0 mm or less, with conventional, root-form implants consisting of larger diameters. This narrow diameter means that less bone is required for implant placement, mitigating the need for traumatic and costly grafting procedures in atrophic ridges. Also, instead of drilling a full-length osteotomy, as is the case with root-form implants, standard mini implant surgical protocol involves drilling a pilot hole roughly one-half the length of the endosseous (threaded section) of the implant body. The mini implant is then advanced to depth with a torque wrench or handpiece driver. If primary stability is achieved, the heads of the mini implants may be immediately loaded with a new or existing denture. This surgical process is both simpler and less traumatic than conventional implant surgical protocols. And the overall cost of placing a mini implant is significantly less than that of a root-form implant.